You can insert pictures into PowerPoint 2013 you’ve acquired yourself, either from someone else or from your digital camera or scanner. These pictures are stored as separate files on your hard drive or other media. 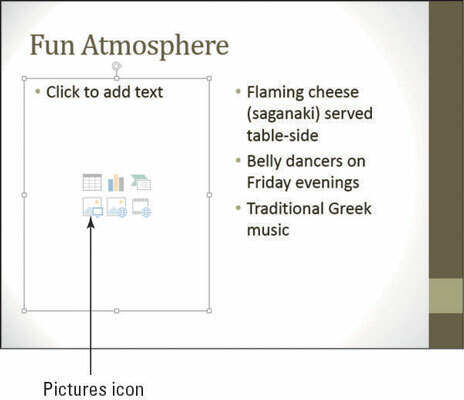 PowerPoint supports many picture formats, including .tif, .jpg, .gif, .bmp, and .png. Just like with online images, you can insert a picture either with the Insert tab’s command or with the placeholder icon. 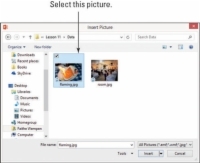 In this exercise, you insert pictures from files using a placeholder and using the Insert tab. 1In a content placeholder, click Pictures icon. See the icon in this figure. 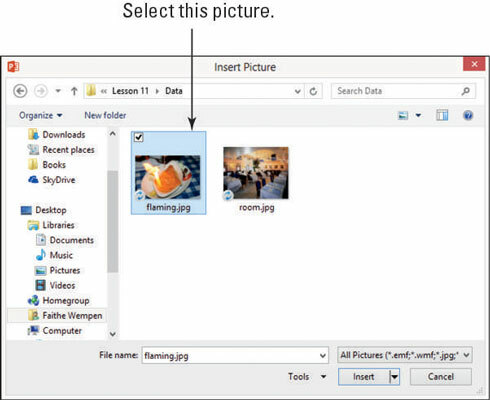 2In the Insert Picture dialog box, navigate to the location containing the pictures you want to use. Click the Insert button. See this figure. The picture of the flaming cheese appears in the placeholder. 3Click slide 4 to display it. 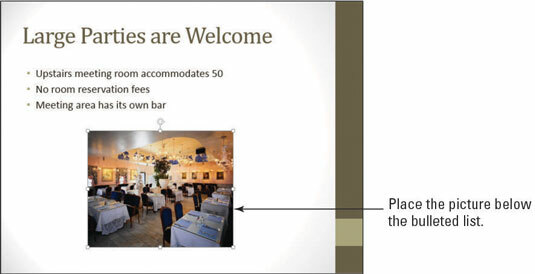 This slide doesn’t have a placeholder for a picture. 4On the Insert tab, click the Pictures button. The Insert Picture dialog box opens. It’s the same dialog box as shown in the figure. 5Click on the picture and click the Insert button. 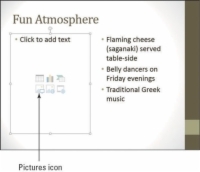 The picture appears in the center of the slide, overlapping the text. 6Drag the picture below the bulleted list. See how the picture is displayed in this figure. 7Save the presentation and close it. Close the presentation by choosing File→Close.